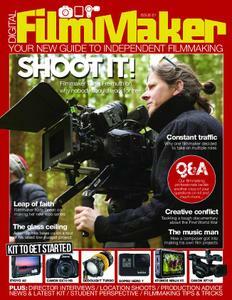 Free download Digital FilmMaker magazine – Issue 61 2018 .We might have well and truly waved goodbye to summer but if the Digital FilmMaker inbox is anything to go by plenty of folks are still out there working away on location. Indeed, this very issue contains projects that have been tackled in all manner of different scenarios, from gritty urban landscapes through to those hard-to-reach spots in the middle of nowhere. Interestingly, this is another edition of the mag that also features a reasonable number of female filmmakers. It’s great to see that more women are making inroads into this exciting creative industry and, I would hope, are able to command similar fees for their hard work too. As filmmaker Tania Freimuth notes in her feature on page 36, nobody should have to work for free. Unfortunately we live in times where a lot of people expect something for nothing, but it would be good to see a reversal of that trend. And, based on the talented people we have in this issue, perhaps we are slowly turning the corner. Nevertheless, plenty of filmmakers are still managing to do it all with little or no budget to play with and that, as always, underlines that anything is possible if you have enough determination to see your project through to the finishing line.